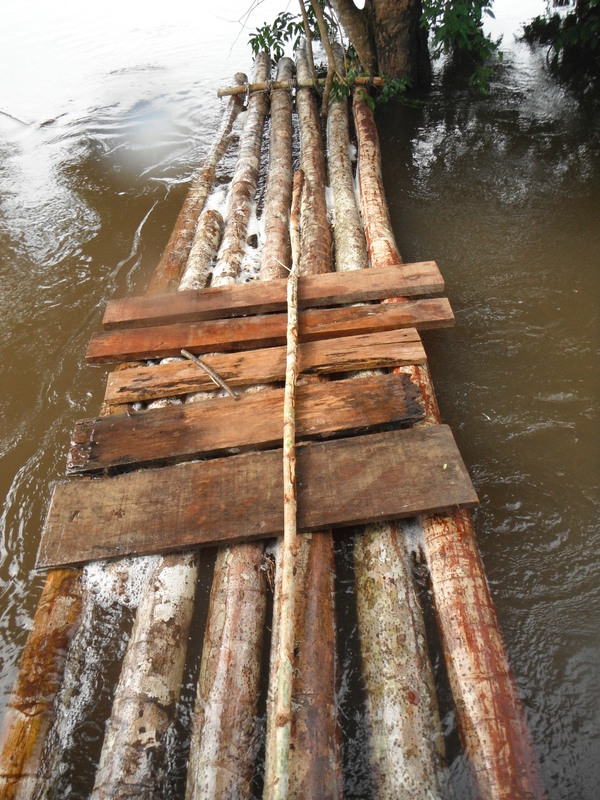 My balsa raft on the Jamanxim River, with scavenged boards for my mangy deck. The work was hard and balsa wood is actually very heavy when it’s in tree form and not made into little airplanes. The trees were about 1km into the jungle, so I had to drag them out using rope and a couple of timber hitches, wade through a swamp, and then float them downriver about 500m. The locals had warned me about a large waterfall downstream known as “Ao Portão de Inferno” – translated, meaning “the gates of hell.” It is about 20 m (60 feet) high. I figured I would just disassemble the raft before the waterfall, portage it downriver, reassemble it, and continue. I also spoke with a few fisherman who had been down there and they told me of at least 50 smaller waterfalls between the place I was at (Jardim do Ouro) and the place where the Jamanxim flows into the Tapajós. Undeterred, I was determined to tackle the river anyways, and continued building my raft. I do love life. So there’s no reason why I shouldn’t just start the adventure further upriver, where there are no rapids or portãos de infernos. New plan: Start on the Tapajós river in São Luis de Tapajós. Down the Tapajós to Santarém, turn east and ride the Amazon to Macapá. This takes about 250 km off the trip, but adds about 50 years to my life. I figure this to be a fair trade. In Itaituba now, close by. Busking and selling paintings for some extra cash. To São Luis in a few. Take care. PS: Also, I put up a new post about my time on the streets of Belém before I went home to the US for a month. Enjoy, and sorry for the delays! So did you use your “surplus of art supplies” to create paintings? What did you paint? Where is the article from Belem? I digg your new style with smaller text and faster updates! Anyways it’s all good, love your stuff! Stay safe and have fun. looking forward to your upcoming posts. I’m curious to hear about your arrest, lol. Flying with your Dad on a SWA trip and he told me about you. Love the website. Bon voyage, happy adventuring! I’m happy that the long expected updates arrived. I keep on checking your blog regularly, keen to read about your adventures. They’re still an amazing read and never fail to inspire me. Good luck with your raft-expedition. I hadn’t read your blog for a while. I like the way your style has developed and the adventures that keep getting crazier. Good luck in the river and whatever comes next! Almost exactly one year ago you left a rather charming little comment on my blog – “Paz y amor, viajera compeñera”. Well, obviously I decided I must start reading your blog immediately and return the favour – only life did that thing it does and carried me away with it; and reading you and commenting back slipped further away down my to-do list. Well, you may be interested to know that you are one of five blogs I’m writing about in a travel writing assignment this week. If I ever publish this in a public place, I’ll let you know. For now I just wanted to say ‘hey’ and ‘I still exist’ and, obviously, I need to do this now before you kill yourself rafting off a waterfall. I will be reading you, promise.